The Cote d'Azur (french Riviera) has a glamour all of its own. From Marseille to Portofino the coastline is laced with beautiful bays, bustling towns, designer boutiques, excellent restaurants and legendary beaches. Cannes is lined with grand hotels and elegant promenades while Nice, a Mecca for artists, is charming with its own narrow streets and colourful markets. Monaco is as exclusive and exciting as its grand-prix, casino and very public royal family lead you to believe. Portofinio, reached by an overnight cruise across the Bay of Genoa, is one of the most picturesque ports in the Mediterranean.It is the playground of the rich and famous. This is the perfect luxury motor yacht and sailing yacht vacation destination. Further east are the islands of Corsica and Sardinia which, compared to the French Riviera, are very untouched. Pretty bays and interesting caves proliferate and many cruises begin and end at the fashionable marina in the resort of Porto Cervo and Sardinia's Costa Smeralda. Italy's west coast and the island of Sicily offer yet more variation of scenery and cuisine. Volcanoes, ancient ruins and the often rocky coastline make the area a very attractive cruising ground. Board your yacht and depart for an afternoon of relaxation and water sports in Villefranche or St Jean Cap Ferrat, followed by a glamorous evening at the Hotel Bel Air. Or take a drive through the profusion of cacti, palms and lemon groves to the picture-book village of Eze, where the restaurant of the Chateau de la Chevre d'Or, a 1,000 year old castle, is a favorite with the cognoscenti. The seaside resort town Saint Tropez is still very popular with the tourists, although the jetset and the in-crowd have long since left it behind. Set on the lovely blue water of the Bay of Saint-Tropez, this modern version of a medieval town is most popular for the line of yachts along the quai, and the facing line of terrace cafés, divided by a parade of strolling tourists and slow cruising expensive cars (photo-7 being a typical example) Behind the cafés, the small streets and old buildings are picturesque, but they're more popular for the multitude of shops and restaurants than historical significance. There are endless possibilities for buying gifts or items of proof that "you've been here". Monaco, an ancient principality steeped in a rich and colorful history, is considered by many to be Europe's most fascinating country. Though the Principality covers but one square mile, it stands as a proud monarchy with his Serene Highness Prince Rainier III as its head of state. Today people visit Monaco and its glittering district Monte-Carlo not simply to vacation, not just to test their standing with lady luck, nor merely to see and be seen, but to revel in the memorable life-enhancing experience that is Monaco. 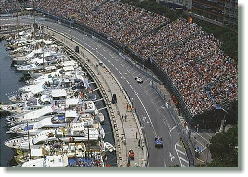 Monaco is also famous for its annual Monaco Grand Prix. You need to move early for this one. Why not join in and enjoy the thrills and atmosphere of what has to be the most glamorous event in the Formula 1. Monte Carlo Charter yacht vacations When Monte Carlo came into being it was almost called Charlesville or Albertville after the heir to Prince Charles III. The fact that neither of these names were chosen in the end may have been due to Prince Charles not believing that the new venture would last into his son's reign. On the other hand he may have liked better the sound of Monte Carlo (Mount Charles) which rolled off the tongue better. Whatever the reason it was most assuredly an improvement on its old name, Spélugues. The Prince need not have worried because within three years of setting it up, the casino had earned enough money to ensure it's peoples' loyalty by abolishing direct taxation and military service! It is difficult to credit now that in the middle of the nineteenth century Monaco was the poorest state in Europe. Nothing useful could grown on its rocky soil and it barely existed by selling salt and Custom rights to France. This is a the location synonymous with the fragrance of sophistication, the playground of the rich and famous. Cruising Cannes, St Tropez, Port de Nice, Cap Ferrat, Monaco, Monte Carlo, Antibes, Menton, St Esteves, Genoa and Portofino guarantees the passionate scenery coupled with visiting greatest anchorages and marinas. Along Italy's northern coast lies enchanting Portofino, picturesquely situated in a narrow cove at the southeastern tip of the promontory of the same name. The tiny port owes its popularity to its beautiful setting, agreeable climate and lush and luxuriant vegetation. This "Pearl of the Mediterranean" has long been known as an exclusive gathering place for the wealthy, artists and actors. In 1935 the city government of nearby Genoa declared Portofino a national monument so architecture has changed very little in the past 60 years as alterations must receive approval. Bronzed and beautiful visitors enjoy the unique ambiance, chic boutiques and quaint cafés that overlook the small yacht harbor. Others explore the surrounding coastline, where tiny villages are tucked away in hidden coves. If your taste runs more toward the clamor of big city life, bustling Genoa is only a short drive away. However, don't miss out on most everyone's favorite pastime - people-watching while leisurely sitting in one of the outdoor cafés or on your own private luxury yacht.